For anyone coming to Hastings on Saturday who isn’t really aware of roller derby, could you explain the sport in a paragraph? 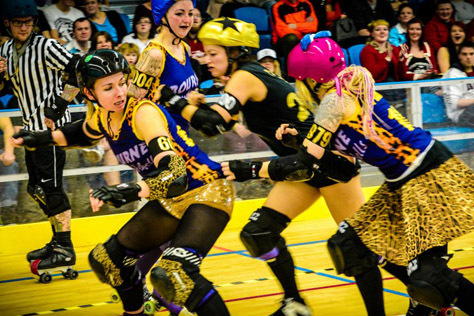 Roller derby is an exciting, fast paced game which brings together speed, tactical gameplay and brute force to create the only sport that’s ever held my attention for more than five minutes. Could you tell us a little about the history of the Bourne Bombshells and your achievements to date? We formed as the Bombshells in December 2011, though a group of us had been skating under a different league name for about six months before then. We didn’t really have anybody with much prior derby experience, so we spent a long time getting to grips with the basics, recruiting and getting lots and lots of scrimmage experience before finally going public this year. We played our first (closed door) bout against the Basingstoke Bullets in March (and won), our first open door bout in April against Kent Knightmares (and lost), had our first public win against Freaky Mon’sters Derby Ladies in Belgium, then came second at Eastbourne Extreme this year, losing the final by just one point! You’re widely known for running the Eastbourne Extreme outdoor tournament. How different is outdoor derby to indoor? We’re lucky enough to have a permanent outdoor track, and we spend a lot of time training outdoors, so most of the nervousness about being on an outdoor surface had subsided long before the actual tournament. The only extra injuries any of us really picked up were grazed fingers, and dodgy tan lines! The opponents for this, your first [home] public indoor bout, are Croydon’s Vice Squad B-team. Do you know much about them? Have you come up against them before? Any particular Vice Squad players you’re wary of? Croydon are one of our closest leagues, so we tend to bump into their players fairly often, and they’ve also been kind enough to have us down to scrimmage on a couple of occasions, so we’ve skated with members of their A and B teams before. A few of us also went down to Rumble in the Cronx [Croydon v Cardiff’s Tiger Bay B-team] a couple of weekends back, so we saw a lot of the Vice Squad in action in the mixed opener as well. Particular players? I’ve scrimmaged with Inara Terror a few times – she’s an A/B crossover, and has been around a bit longer than some of the others, so I’m keeping an eye on her! Angel DDelight is one to watch as well, I think. I saw her floor a few girls in the mixed opener, so I’ll be watching out for her hits. Are there any Bombshells players or tactics the crowd should keep an eye out for? Ahh, I never share tactics before a bout! We’re a very close knit team, though. We’re all really good friends and we pretty much do everything together, so I think that kind of bonding is really going to work in our favour. Bullet Bomber is a great player to watch – She was on my Sur5al Remix [a 15 team, 105 mini-bout tournament] team this weekend just gone, and the standard of the other teams was so high, we were really out of our comfort zone, and I think it’ll be interesting to see how that will change her gameplay for the weekend. We’ve also got a couple of players who are really improving; Silk Scream just spent the whole summer working at a roller disco, so she’s been spending 20+ hours a week on skates, and Deegenerate has been putting a lot of work into her technique and these last few weeks has really impressed all of the coaches with her progress – even I’M looking forward to watching them, and I skate with them every week! Once this first public bout is crossed off the To Do list, what other plans do the Bombshells have for the near (and more distant) future? We’re fairly busy until the end of the year, actually. Myself, Sassy McAwesome (bench), Filthy Lorenzo (ref and Bomb S’quad men’s derby team member) and Pettichoke (Head Non-Skating Official) are all off to Block Around the Clock next weekend for the 24 hour scrimmage. In October we’ve got some girls skating and I’m bench coaching in the Malice Through the Looking Glass (Surrey Roller Girls home bout) mixed opener and we’re bouting Bristol Bees and Bath Roller Derby Girls in the same weekend (closed door, I’m afraid). In November we have another public bout against our sister league the Basingstoke Bullets, and then we’re teaming up with them to put together a team for Rookie Sur5al! We’re also hoping to become a UKRDA member league before the year is out. We’ve got some exciting stuff coming up next year too, but it’s top secret at the moment! Are you expecting a tough battle? Would you care to make a prediction for the score? I think as a team, we have more experience, and we’ve skated and bouted together a lot more, but they have the advantage of a huge and knowledgeable team of referees to keep them in check, and the benefit of being able to have regular practice with their A team, so it’s a difficult one to call. I suppose we don’t really know what to expect, but I have every faith in the Bombshells. I’d love for it to be a close game – they’re more fun to play, and they’re more fun to watch. Any tips for any derby virgins in the crowd who might be a bit bewildered by it all? Don’t be afraid to ask questions – Generally, a large proportion of the audience is made up of derby players, and we LOVE talking about derby, so if you get confused, ask someone with a number and a silly name on their back. For any total newbies, we will be running a short demo just before the bout starts, so hopefully everyone will be able to follow the basics. And for those in the crowd who get so excited by the sport they want to get involved in it themselves, what opportunities are there? We actually have a taster day planned on September 15th. We open up our practice for two hours, and anyone who’s interested can drop by, we’ll lend them some gear and get them started skating (we may even have a qualified skate instructor on hand), show them a few demo jams, and then we generally play some off-skates derby too, which is incredibly silly, but really good fun. There are currently opportunities for both male and female players, referees, non-skating officials, and generally anybody who wants to get involved in any way. We teach everyone everything they need to know, so no previous experience is required – a little commitment and enthusiasm is all it takes. 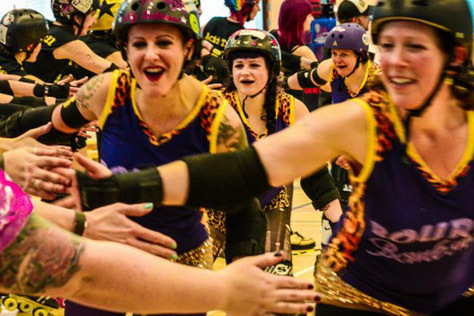 For anyone who might not be aware of Croydon Roller Derby, can you tell us a little about your history and achievements to date? 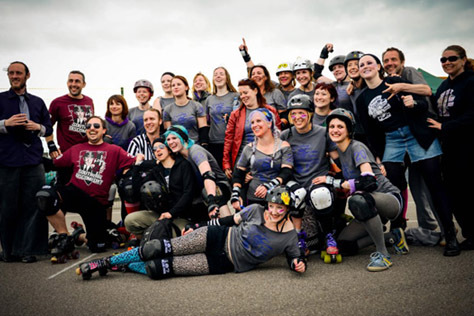 Croydon Roller Derby was founded by Mosquito, formerly of London Rockin’ Rollers, in 2010. With nowhere to skate a collection of friends used to skate outside on the high streets of Croydon. CRD has continued to grow and in August 2013 we are able to launch our B team and have a strong pool of skaters vying for spots on the squad. How has this year gone for CRD? Our A team Riot Squad have been undefeated in 2013 and won Eastbourne Extreme for the second year running in July. They take on their first International Tournament in Nantes in October and have big plans for the 2014 season. Currently ranked 26 in Europe we know CRD’s A and B teams are going to go from strength to strength. Whilst your A-team is fairly well established, how new to bouting is your B-team Vice Squad? This bout will be the first time our B team have skated as a single collective publicly. Having popped their cherries in a variety of mixed openers across the country they’ve picked up some skills and tactics that they each bring to their game. Working closely with Riot Squad in recent weeks they’ve been building up their confidence and skills and are now ready to hit the track. Are there any particular Vice Squad players or tactics people should keep a look out for on Saturday? It would unfair to pick out skaters on their first game so we think they all need to be watched and check out their awesome individual skills on the track. As for tactics – we can’t give them away! Do you know much about the Bourne Bombshells? Have you come up against any of them before? We’ve met the Bombshells a variety of times, we’ve hosted them for a training session, attended a mixed session with them at Surrey and were lucky to have been part of their amazing tournament Eastbourne Extreme. We know they’re a dedicated team of women whose game has strengthened this year and they’ve worked extremely hard. We’re massively proud to be part of their first open door! Are there any BB players you’re particularly wary of? Players we’re worried about of course include Toxic Block Syndrome, the Bombshells head coach. She’s picked up some rad moves over the last few months and is fearless on the track! Bullet Bomber is also one of our favourites; she literally does bomb her way round the track! We love all the Bombshells and know they’re going to be a tough match for our new team. We’ll be happy to put some points on the board and take away a fantastic experience if nothing else. Are you expecting a tough battle? Would you care to make a prediction for the score? I think with both relatively new teams (the Bombshells’ first public bout and Vice Squad’s first full game together) it could be anyone’s game and I think both teams will put on the biggest fight to take away their first wins. Prediction wise it’s an uncertain one, but we’ll go for Bombshells 150 – 125 Vice Squad. Who knows!